We promise you winter is ending. Spring is here, and many of you will be spending more time outdoors. Unless of course, you’ve already been spending time outdoors. If you live for winter sports, it’s time to say goodbye to your hockey stick, skates and skis and trade them for your baseball glove, golf clubs, and tennis rackets. And if you’re looking for a place to store your winter sports equipment, A.B. Richards has you covered. We have the products that can help you store anything from a pair of skates to uniforms and equipment for an entire hockey team. A.B. Richards will rent you portable storage containers and we’ll bring them to your home, office or work site. Why travel across town or farther to a storage facility? A.B. 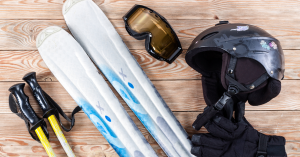 Richards makes it easier for you, so we want to give you some easy tips about storing winter sports equipment. As the weather warms up, the chance to hit the slopes to ski or snowboard are dwindling. Ski, snowboard and clothing retailer evo gives suggestions for storing skis and boards for the summer. The first step is to clean them. They suggest using a garden hose to get rid of the grime. Spray everything down thoroughly and try to avoid letting water in the bindings if you can avoid it. Also, avoid using degreasers or detergent which could affect the binding lubricant. Next, sharpen the edges to reduce rust and wax the bases with an all-temperature wax or a warm-weather wax. Don’t scrape it off and be sure to cover the edges. When you’re ready to store, make sure they’re in a cool dry place and avoid putting pressure on the camber or rocker. Pull the liners out of your ski boots, make sure they’re completely dry then buckle the boots loosely so they hold their shape. Skates also need some TLC. According to the website All Star Activities, It’s important to keep your skates sharp and to use a good technician for sharpening skates. If you’re a figure skater, the technician should ask for your weight to help adjust the skates for landing jumps. Make sure that your skates are wiped dry when you’re off the ice. Check blade screws which can get loose and make certain that you blade area and mounting surfaces are dry before you store the skates. Storing them with guards on could cause them to retain moisture and rust. Boots should also be dried naturally. Keep them polished to seal the leather from water. When storing hockey equipment, you need to wash and dry the uniforms to get the stink out and hang them up. Naturally drying gear before storage is the best way to keep it fresh. There are also sprays available to get the smell out of sports gear. The website How to Hockey recommends you wash your gloves but don’t put them in the dryer. A little prep work before storing your winter sports gear can go a long way towards keeping them fresh and in good working order. A.B. Richards can also give you a clean and secure place to store your equipment. Whatever your storage needs are, A.B. Richards has a portable storage container for you. Contact us today.